The BFA is delighted to announce that Michael Board and Georgina Miller are the 2017 UK National Champions. The selection is based on UK and international competition results across all major pool and open water disciplines. Competitive freediving requires an exceptional level of commitment to training as well as travelling across the world to participate in the leading depth competitions.Georgina and Michael have a long history of competitive freediving for Great Britain in individual and team championship events. Each of these talented divers have broken multiple national records and have competed at some of the world’s most prestigious freediving championships. Georgina is a six-times national record holder, with a personal best of just over seven minutes in the Static Apnea discipline. Michael has set sixteen British National records and is the current British record holder in two depth disciplines for Constant Weight at 108m and for Free Immersion at 100m. Georgina and Daan Verhoeven run Aquacity Freediving (www.aquacityfreediving.com) at Porthkerris in Cornwall. Michael Board runs Freedive Gili, a Freediving School in Gili Trawangan, Indonesia (www.freedivegili.com) and is on Instagram @mikefreediver. Congratulations to Georgina and Michael for their outstanding freediving achievements and we wish them every future success! British freediver Harry Chamas has set a new national record of 120m depth in the No Limits freediving discipline in Kalamata, Greece. The previous British record of 101m was set byJ im Lawless in 2010 in Sharm el Sheikh, Egypt.On 18 September 2017, Harry descended on a weighted sled running along a rope to a depth of 120m, under the supervision of a safety team. The sled incorporates a scuba air cylinder and a large air bag. On reaching the target depth, the freediver inflates the air bag with air from the cylinder, which then rushes to the surface, taking the freediver with it. Harry began freediving in Australia eight years ago and is a freediving coach. He set a national record last year in the Variable Weight freediving discipline reaching a depth of 105m (descent on weighted sled with ascent by finning or pulling on the rope to the surface).Harry’s freediving coaching site is at (www.freedivepassion.com). Former Royal Marine Michael Board extends his British national freediving record. Michael Board and freediver Dean Chaouche set additional national records in two other freediving disciplines. 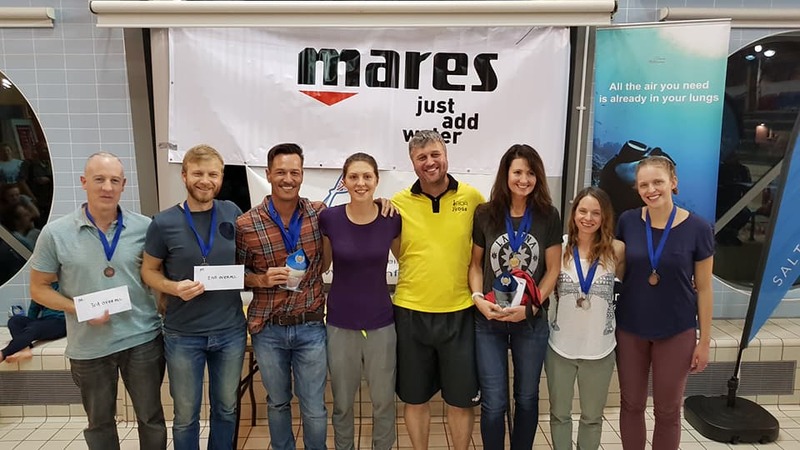 Michael Board and Dean Chaouche will be competing again as part of the mixed, six-strong UK freediving team at the AIDA Freediving World Championships in Roatán, Honduras. This competition will take place from 22 August to 2 September 2017. Every year, the BFA selects the male and female National Champion based on competition results across all disciplines in the pool and open water. For UK divers this means training year-round and often having to travel abroad to reach the depths needed to excel on the world stage.The 2016 champions are Tim Money and Liv Phillip. 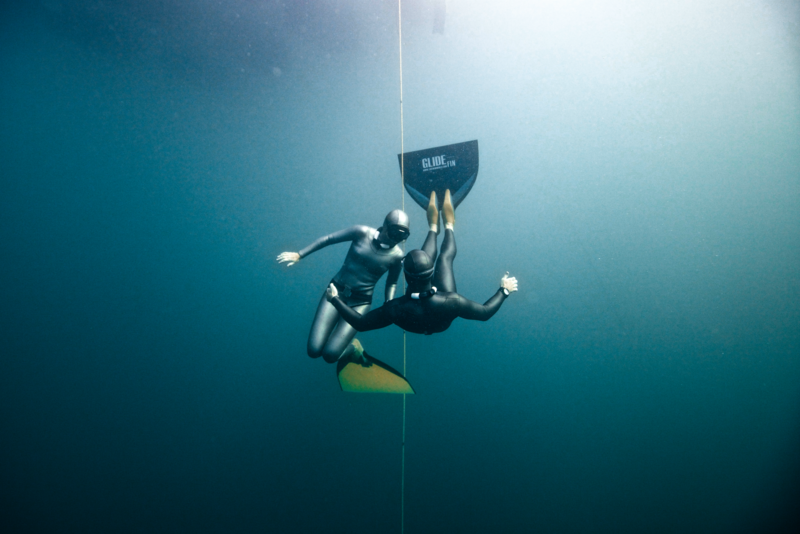 Both athletes are cornerstones of British freediving; they are not only consistent high performing athletes on the pool circuit, but they rank at a high level in depth disciplines as well. The BFA would like to congratulate them both and wish them every success in 2017! For more information, please contact Louise Nelson, Press Officer, British Freediving Association at press@britishfreediving.org. Dean Chaouche claimed his second British record in Constant Weight No Fins (CNF) diving to a depth of 78m at the inaugural Blue Element International freediving competition, adding 4m to his previous record of 74m, set at Vertical Blue in the Bahamas on 22 April this year. Many believe CNF to be the purest freediving discipline; the athlete relying on strength and technique, may only use his arms and legs to propel himself through the water, in a style of breaststroke, down a weighted guideline and back. And after giving the above quote, the next day Dean completed a 91m FIM dive, so it appears that the record holder has regained control and focus and is on track to attempt the CWT dive. Blue Element International is taking place on the island of Dominica, in a huge volcanic crater where water drops to depths of hundreds of meters, just a short distance from the shore. Athletes taking part in the competition have the choice of competing in any one or all of the competition depth disciplines: Constant Weight (CWT), Constant Weight No Fins (CNF) and Free Immersion (FIM). The competition started on Friday 4 November and will finish on Friday 11. British freediver Harry Chamas has set a new National Record of 105m depth in variable weight in Kalamata, Greece. On Friday 14 October, Harry took a weighted sled down past 100m to reach his target, before swimming all the way back to the surface. This exceeds the previous variable weight record of 80m, held by Mark Harris since 2007. Harry started freediving in Australia seven years ago and this year became a staff instructor at the Freediving Club in Greece, which has allowed him regular access to the sea. He was head of safety at the recent AIDA World Championships held in Kalamata. However, he’s not always had access to such depths. Harry says “most of my time I have not had access to depth below 30m, but it was all I needed to learn how to put myself into deep states of relaxation and to master my technique”. He added that “visualization can be just as valuable as diving for your training. Being confident is the key”. You may not see Harry around the competition circuit, however, as he explains that “I’ve never enjoyed competition, I don’t handle the nerves very well, and the idea of doing an official attempt did make me nervous. But each time I thought about the attempt and would get an adrenaline rush, I would use it as an opportunity to control myself and used meditation to drop my heart rate and enter a place of peace, which was fantastic training”. “On the day of the attempt I was in a perfect place mentally and was well rested, the ocean was calm, and I was amongst friends. It didn’t take me long to get prepared, in fact I didn’t have any nerves”. Despite poor water visibility and cold water, Harry achieved a “perfect descent” and despite having few visual references on the way back up, he says he felt “fresh as a daisy” on the surface. Harry dedicates this national record to his Granddad who is sick in hospital at the moment. He thanks Stavros Kastrinakis, Roxane Nicholls, David Tranfield and Brian Crossland for making this dive possible. DNF national record for Alice Hickson & Two World Records for Poland! On Saturday 2 July, Alice Hickson broke yet another national record, in the A-Final at the Individual AIDA Pool World Championships in Turku, Finland, swimming 180m without fins on one lungful of air (over 7 lengths of a 25m pool) and winning a silver medal. Alice held the previous British record of 174m, set at last year’s World Championships in Belgrade, Serbia, for which she won a gold medal. The 180m swim was a personal best for Alice and was just meters short of the winning World Record dive of 185m by Magdalena Solich of Poland. This record marks a fifth for Hickson in a freediving career of just eighteen months! Two World Records were also broken in the DNF World Championship A-Finals, both by Polish Freedivers, Magdalena Solich and Mateusz Malina, and both spectacular performances and strong. Magdalena swam 185m breaking Natalia Molchanova of Russia’s World record of 182m, set at the AIDA Pool World Championships in Belgrade in 2013. Natalia’s presence at World Championship events is sorely missed she was one of the most loved and revered freedivers to grace the sport of freediving. The icing on the cake for Poland came when Mateusz Malina broke his own World Record of 232m set just a few days earlier, swimming 244m (that’s over 9 lengths of a 25m pool). For the first time ever in the history of the sport of freediving, people at home could watch the event unfold moment by moment with live streaming and commentary by Carla Hanson (AIDA International President) and Antero Joki (Finnish Freediver & AIDA International Technical Officer). This potentially marks a new era for competitive freediving. Alice Hickson Breaks Dynamic British Record at AIDA World Championships! On Wednesday 29 June at the Individual AIDA Pool World Championships in Finland, Alice Hickson swam 200m on one breath of air using a monofin (that’s 4 lengths of an olympic size swimming pool), breaking the British dynamic national record by 14m. The previous record, 186m, was held by Rebecca Coales set on 29 November 2014 in Stockport. Impressively, Alice now holds all three pool discipline national records: in competition she has held her breath for 6 minutes 58 seconds, swam 174m with no fins and now 200m with a monofin. Alice has been freediving for less than two years and burst onto the scene in style last year’s Pool World Championships in Serbia when she won a gold medal and title of World Champion, a bronze medal and broke 3 national records. Not bad going for competing at her second ever competition! The Pool World Championship in Finland is not over yet – athletes compete in the three pool freediving disciplines: static apnea, dynamic no fins and dynamic. The qualifying heats are now complete and Alice has won a place in all three of A-Finals which is quite a feat – it shows what an all-round athlete in the pool she is. The A-Finals will start on Friday 1 July and finish on Sunday 3 July. Dean Chaouche sets new National Record of 74m No Fins! British freediver Dean Chaouche is having a great week at the Vertical Blue depth competition in the Bahamas. On the opening day (22/4) he set a new British record in Constant weight No Fins (CNF) category of 74m, which is one metre deeper than the previous record set by Dave Kent in 2014. On Sunday 24/4 he’s gone on to become the second British man to reach 100m in Constant Weight (CWT). Dean said on Twitter this week that “It’s been very hard to get here, there have been many hiccups, but I’m so glad I made it!”. Fellow Brits Liv Phillip and Georgina Miller are also competing at Vertical Blue and to date have had successful dives. We await more news from all our divers as the competition unfolds into next week. Keep up with the latest news on our Facebook page, and watch a video of the dive here!